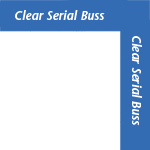 Clear High Speed Serial Buss takes our Clear USB cable, and adds a special high performance data cable using silver-plated conductors. Each conductor pair in both cables is discreetly shielded, and each cable has its own double-shield. This premium dual-cable USB cable adds depth & realism, and improved imaging to your digital system. Clear High Speed USB is available with Type-A & Type-B connectors.